iClassSE Phantom Reads | Telaeris, Inc. 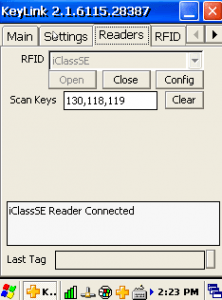 If you are experiencing card reads randomly without a badge being present while using a iClassSE reader module, try the following. 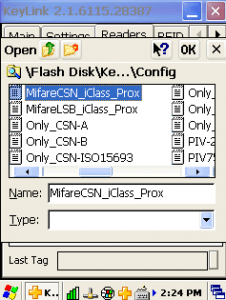 If you are using a proprietary time of card that is not stndard iClass or Prox, please contact Telaeris first. Click on the “Readers” tab on top. You should see the following screen. 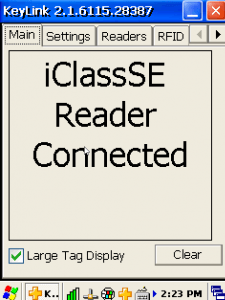 If the iClassSE Reader is not connected, press open. If you are getting a failure, please contact Telaeris. 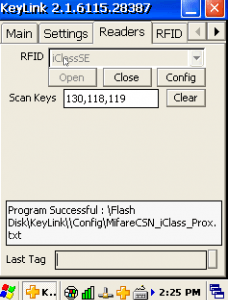 Select the “MifareCSN_iClass_Prox” file and click ok.
Click “Close” and remove the battery til the device shuts off. Reinsert the battery and turn it on. This should solve the phantom reads. If you have any questions please contact us.